For a city that has been made famous by its gravity defying leaning tower, there's a bit of irony in Pisa AC's penchant for tragic and spectacular crashes. Even so, it will be a long time before anyone does so in more spectacular fashion then they did last season which, to further boost the ironical undercurrent, also happened to be the year when the club was celebrating its centenary. 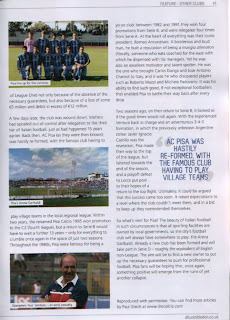 Having kicked off in the hope of winning a place in the play-offs, Pisa opened up with two defeats and their season never really took off. There were a couple of famous victories - those against Parma and local rivals Livorno stand out - but they weren't enough to push the clubs in the top six. Nor was it good enough to save manager Giampiero Ventura's job as the frustration about the failure to press-on saw him being sacked. In his place came Bruno Giordano. Bad move. Pisa had been floating in around in the middle of the table before his arrival but much of that had been down to Ventura's tactical nous and his ability to motivate players. Without him, they went into free-fall and two days from the end of the season they slipped to fourth which would have meant a play-out game to retain their place in the league. But that wasn't the end of the story as a 1-0 home defeat on the final day of the season against Brescia - when Pisa were a man up - coupled with results elsewhere saw them slip even further. On the 94th minute of the final day of the season they were in a direct relegation spot, the first time that they'd been in that position all year. Then came even worse news. A few days after this bitter defeat, president Luca Pomponi announced that he wasn't willing to remain in charge and put the club up for sale. With a guarantee of €2.75 million needed for any club to start the season, and with Pomponi having only some €1.1 available it was time to panic. Players started being sold off and season tickets were put up on sale (with the promise of a refund should the club go down) in order to make up for the deficit. It wasn't to be. 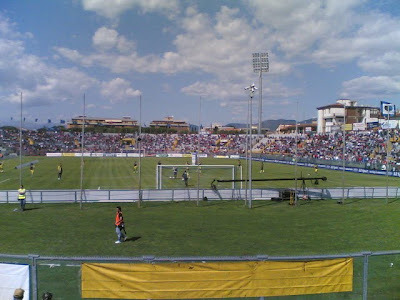 In early June, the Covisoc barred Pisa from taking part in the Lega Pro Prima Divisione (the equivalent of League One: the Italian lower leagues went through a Football League style re-branding last year) not only because of the absence of the necessary guarantees but also because of a loss of some €5 million and debts that totalled in excess of €12 million. A few days later, the club was wound down. It wasn't always this way. 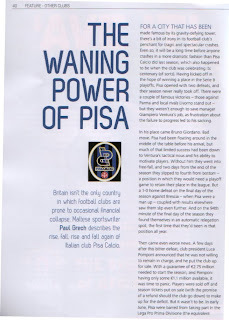 Throughout the eighties, Pisa were famous for being a yo-yo club: between 1982 and 1991 they won four promotions from the Serie B, which is another way of saying that they were relegated just as many times from the Serie A. At the heart of everything at the time was their iconic president Romeo Anconetani. A boisterous and loud man, he built a reputation of being a 'mangia allenatori' (someone who eats up managers) for the ease with which he got rid of his managers. Yet he was also an excellent motivator and an even better talent spotter. He was the one who brought Carlos Dunga and Jose Antonio Chamot to Italy; down to him the discovery of players like Roberto Muzzi and Michele Padovano. It was the ability to dig up such good, if not exceptional players, that enabled Pisa to battle their way back after every drop. Two seasons ago, upon their return to the Serie B, it looked as if the good times were about to return. With the experienced Ventura back in charge and an adventourous 3-4-3 formation in which the unknown Argentine striker Javier Ignacio Castillo was the revelation, Pisa made their way to the top of the league only to falter towards the end of the season where a play-off defeat to Lecce put paid to their hopes of a return to the top-flight. Ultimately, it could be argued that this success came too soon. It raised expectations to a level where the club couldn't support them but, in a bid to keep up, over extended themselves. So what's next for Pisa? The beauty of Italian football in such cases is that all sporting facilities are owned by the local government meaning that the city's football club will always have somewhere to play in. Already, a new club has been formed and will take part in the Serie D which, roughly, is the equivalent of English non-league. The aim will be that of finding a new owner to put up the necessary guarantees to push for professional football. In the hope that, once again, something positive emerges from the ashes of this latest fall. 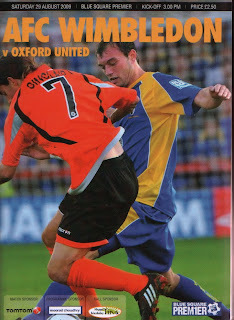 This article appeared on the AFC Wimbledon official match programme for the home game against Oxford on the 29th of August 2009. It is also featured on the blog on Italian football Il Re Calcio as well as the football site 200%.